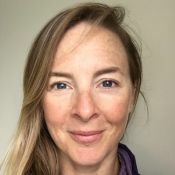 Senior Yoga Medicine® teacher Rachel Land breaks down four unique options for freshening up your flow—each of which can benefit your body in different ways. The more variety we offer ourselves, the more adaptable we become. This applies in all areas of life, including the ways we use our bodies. Most of us, however, are creatures of habit, tending to revisit the same movements over and over. When we stay in our comfort zone, we run the risk of getting stuck in a rut. Unfortunately, yoga is no exception to that rule. Certain movements appear repeatedly in vinyasa practice, like the vinyasa from plank through four-limbed staff pose (chaturanga dandasana) to upward facing dog (urdhva mukha svanasana). There’s nothing wrong with this sequence except that its frequent use robs us of opportunities to explore other sequencing possibilities. That’s why varying this familiar movement pattern can be useful every now and then. Fortunately there are replacements for chaturanga that can be incorporated into a sun salutation without breaking its rhythm. The pace of the typical sun salutation is to inhale from standing forward fold (uttanasana) into a halfway lift (ardha uttanasana), exhale as we step or jump back through plank and lower into chaturanga, inhale into upward facing dog, and exhale back to downward facing dog (adho mukha svanasana). The following four alternatives fit seamlessly into the same rhythm while opening us up to new pathways and new possibilities. This potentially more accessible variation replaces chaturanga with child’s pose (balasana), and upward dog with a supported version of camel pose (ustrasana). Child’s pose presents a welcome rest for many students. It also creates a gentle stretch for the pectoralis major on the chest, the erector spinae on either side of the spine, and the gluteus maximus on the posterior hip. Camel can certainly be practiced as a deep backbend, but with the support of hands propped on either side of the sacrum it provides the same heart-opening benefits as upward dog with more easily controlled depth. A final but key benefit of this variation is reduced load on the wrists. The sustained wrist extension entailed in plank to chaturanga to up dog is a common source of discomfort for vinyasa students. While there is still some body weight on the hands in downward facing dog, replacing chaturanga with child’s pose and upward facing dog with camel gives the wrists an opportunity to rest. Try it: After you inhale to lift halfway, begin your exhalation by planting your palms and stepping back to plank pose. Continuing to exhale, lower your knees and stretch your hips toward your heels to find child’s pose. As you inhale, come up to a kneeling position, retract your shoulder blades, and set your hands on the back of your pelvis for a supported camel pose. On your exhalation, place your hands toward the front of your mat, tuck your toes, and lift your knees to transition back into downward facing dog. This alternative builds strength in two key areas by replacing chaturanga with a wide-arm press, and upward facing dog with a cactus-arm variation of locust pose (salabhasana). The first area is upper-body strength and shoulder stability. Many of us struggle to maintain a stable position for our upper arm bone, or humerus, in chaturanga’s narrow arm position. Gravity draws the head of the humerus toward the floor and we wind up stressing the front of the shoulder joint. In contrast, a wide arm position engages the same muscles as chaturanga (pectoralis major on the chest, anterior deltoids on the fronts of the shoulders, and triceps on the backs of the upper arms) with more stability in the shoulders. Cactus arms in locust then teaches us to use the infraspinatus and teres minor, the shoulders’ external rotators, to actively maintain that position. The second area is posterior-body strength. The front of the body tends to be stronger and more dominant than the back, and locust can help to correct that imbalance. It requires use of the erector spinae muscles on either side of the spine to lift the chest, the rhomboids and middle trapezius to retract the shoulder blades and lift the arms, and the gluteus maximus and hamstrings to lift the legs. Most of these muscles are neglected in daily life, and potentially in yoga as well, so they benefit from more opportunities to engage. 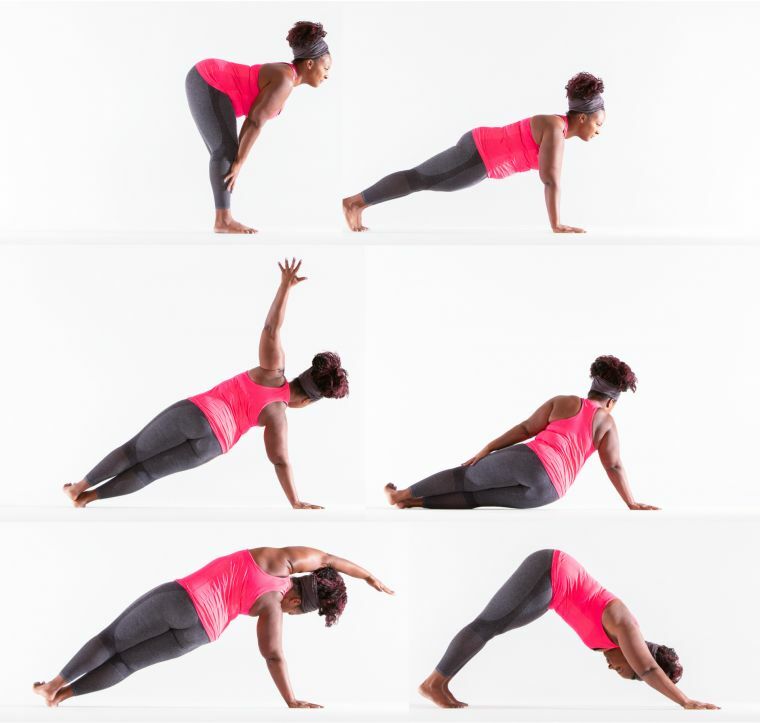 Try it: As you exhale and step back from your halfway lift, place your hands on the top edges of your mat (fingers pointing forward as they would for plank but hands much wider apart) and slowly lower onto your belly with your elbows wide (rather than hugging in toward your body like chaturanga). Once on the floor, slide your hands forward to bring your elbows onto the floor, taking a cactus-arm position with your upper arms level with your shoulders. Inhale to lift your head, chest, arms, and legs into locust pose. Aim to keep your hands a little higher than your elbows to accentuate the external rotation of your arm bones. On your exhalation, retrace your steps: Lower your head, chest, arms, and legs, slide your hands back to stack under your lifted elbows, and use a wide-arm press-up to lift up and back to down dog. You can leave your hands mat-width apart in down dog or walk them in to shoulder-width apart before continuing your sun salutation. This option replaces chaturanga with a variation of side plank (vasisthasana) in which the hips dip toward the mat. For upward facing dog it substitutes a side plank variation with the hips lifted, creating a rare opportunity to engage the side-body muscles. We spend much of our yoga practice in the sagittal (forward-to-backward) plane, but this sequence forces us to support ourselves in the less familiar lateral (side-to-side) plane. Lifting our hips away from the mat strengthens both the gluteus medius, a key stabilizer on the side of the pelvis, and the quadratus lumborum, an important lateral support for the lumbar spine. Meanwhile, keeping the supporting humerus steady in its socket, despite the movement of the pelvis, trains the rotator cuff muscles for improved shoulder stability. Try it: From your halfway lift, exhale to step back to plank pose and immediately move into side plank, rolling onto your right hand and outer right foot. Hug your right upper arm into its socket and wrap your scapula under your side ribs to stabilize your shoulder; then lower your right hip toward the mat, reaching your left arm along the left side of your body. As you inhale, press the floor away, lifting your hips as high as you can, while sweeping your left arm overhead. On your exhalation, release your left hand to the mat, and pivot onto both feet to transition back into downward dog. With your next sun salutation, repeat the flow on your left side. In this flow, chaturanga is replaced with a “bear crouch,” a variation of table pose with knees hovering away from the floor; upward dog is replaced with dolphin pose (ardha pincha mayurasana). This option tests your leg and shoulder muscles in slightly new angles. Bear crouch strongly engages the quadriceps. The forward shift into dolphin pose then loads the upper body, and the overhead position of the arms challenges shoulder stability and mobility equally. The final sting is the tricep strength required to lift your elbows and straighten your arms in the transition from dolphin back to downward dog. Try it: Exhale to step back from your halfway lift to downward dog. Keeping your arms straight, bend your knees until they hover just above your mat. As you inhale, squeeze your legs straight and lift your hips, simultaneously bending your elbows and releasing your forearms to the mat so that you finish in dolphin. As you exhale, press into the inner edges of your hands to straighten your arms, returning to downward dog to continue your flow. Every flow offers unique benefits and challenges. One option isn’t better or worse than another. The key is to embrace variety, building resilience by challenging ourselves in multiple ways. So try spicing up your sun salutations with one of the options outlined here, or come up with fresh ideas of your own—and you just may find yourself climbing out of a rut you didn’t even know you were in.